Lytse Marre v.d. Eenhoornleijn (calling name Marre) is our second Frisian Staby. 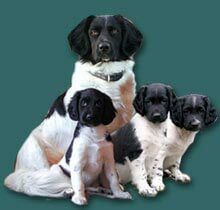 She came to us because we wanted another dog and also because the wish to breed with these wonderful dogs popped up. 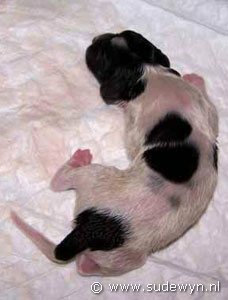 If you're going to breed, then of course you must do so following the guidelines of the breed association, meaning (among other things) we needed to find a Staby of good and healthy parentage. 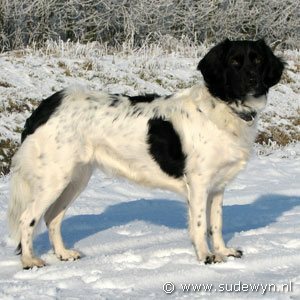 We went looking for an experienced breeder with the type of Stabyhoun that appealed to us regarding looks and working abilities. By visiting dogshows, clubmatches and breedassociation activities, we eventually came to Kennel v.d. Eenhoornleijn. Marre arrived in March 2005. After the puppyclass and several following classes, we are still in full retrieving and obedience training. 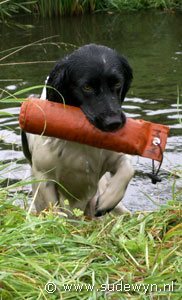 Marre has earned an A-certificate in retrieving and really loves the game. But she doesn't like the pressure on match-days, they're too crowded and eventful. She prefers a one-on-one training in the field any time. On May first 2014 Marre died of bonecancer. She lived to be 9 years old.